Palmako Hanna 7.6m² The Palmako Hanna 7.6m² is one of our best-selling pavilion style summer houses featuring 34mm wall planks. This hexagonal summer house is perfect for creating additional space in the garden and is ideal as a retreat, dining or play area. 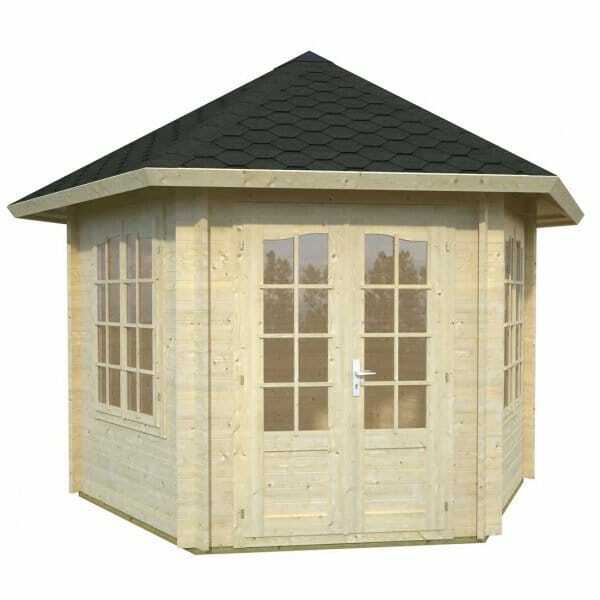 The Palmako Hanna 7.6m² features a 3.5m diameter with 6 sides and has extremely sturdy roof construction (this prevents roof sag - which can be an issue with some competitors log cabins) and a very solid floor. The Palmako Hanna Log Cabin sits beautifully and will create an attractive feature in any garden. Windows made of laminated wood with Full Assembly Instructions.